The Church of God (Cleveland, Tennessee) is one of the major Pentecostal bodies in the United States. This book contains the results of a study conducted in that denomination regarding women and ministry. Some books that deal with this subject focus on biblical texts to either support or limit women’s place in ministry. This book, however, asks women ministers what they want. Not surprisingly, what they want is equality in ministry. The Church of God has 3,088 licensed women ministers in the United States; 726 of them participated in this survey (29). Those who made up this sample group are from different age and ethnic groups (13). The respondents come from different parts of the country (30–31) and have varying degrees of education (55). One thousand randomly chosen male ministers in the denomination, called ordained bishops, were also invited to participate in the study, and 16 percent of them responded (34). This book is written by two insiders in the Church of God: Kimberly Ervin Alexander and James P. Bowers. Both are people of high academic credentials, with PhDs. Alexander is a historical theologian who has in the past served as an assistant vice president for a seminary and is also a past president of the Society for Pentecostal Studies (12). Bowers has served as a pastor and seminary vice president (12). The main body of the text consists of seven chapters: Hearing Their Voices; What They Believe about Family; How Power and Leadership Function; Are Women Flourishing as Ministers? 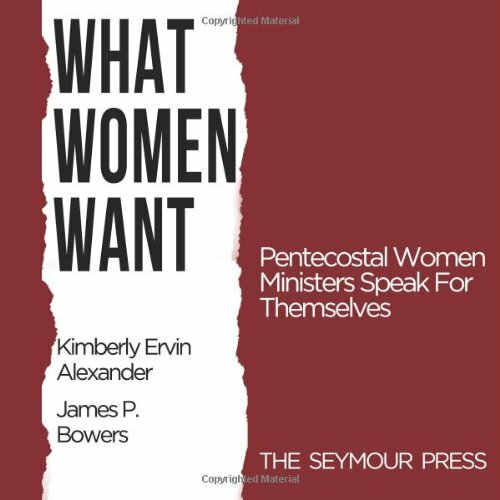 ; What Women Can Expect in Compensation and Advancement; What a Pentecostal Woman Minister Looks Like; and Looking from the Outside by Cynthia Wooleever. Chapters 2, 3, 4, and 5 each contain two responses from women ministers in the Church of God to the material presented. The book also contains three appendixes. The study in this book is very detailed, with many facts and figures, some of which are presented in graph and chart form as well. The fact that the Church of God has 3,088 licensed women ministers in the United States may at first seem to be a very encouraging sign, and, in some ways, it is. At least the church recognizes that women have God-given ministries and acknowledges these ministries by giving the women ministerial recognition in the form of credentials. However, a closer look shows that these women are definitely not equal with men in ministry. For example, women are “for the most part” not allowed to serve in “state or national positions of authority in the USA” (13). Even though they are credentialed ministers, they are not allowed to vote in the General Council of the General Assembly (13). This means that they do not have a voice in the policies that affect their service that are adopted by their denomination. They are clearly at a disadvantage as well in the areas of financial compensation and opportunities for advancement. The book chronicles the history of the place of women ministers in the Church of God and notes the changes in policy that have taken place over the years. The study presented in this book yields a profile of what the typical Church of God woman minister looks like: “married, white and middle-aged, politically conservative, college-educated, and is either an evangelist or pastor of a church she founded” (122). The study also sets forth some of the reasons why women are not provided with equal opportunity in the denomination; these include biblical understanding and church tradition (130–31). The women respondents feel that the “other reason” they are being restricted is because of “the difficulty that some men have with women in leadership” (136). Male respondents said their objections are based on their understanding of the teachings of the Bible (136). Though it is not a major feature of the book, it is clear at certain junctures that a sense of hurt and frustration exists among women about the present position of women ministers in their denomination. One result that may be a surprise to CBE readers is that the majority of women ministers who took part in this study hold a traditional view of family—that is, they believe that the man is the priest of the home and the leader in decision making (43). Only 28 percent of the women believe that “Women and men share equal responsibility and leadership in the home” (43). The authors are to be commended for giving a voice to the women ministers in their denomination. It is significant that one of the authors is a man and the other is a woman. Both they and the women who participated in this study are also to be honored for not leaving their denomination. Instead, this book will bring needed change from within. Although the book deals with the struggle for ministerial equality of women in a particular denomination, I suspect that it has relevance for other church bodies as well. May the Lord bless this volume and use it to bring greater equality to women ministers in the Church of God and beyond.